Excessive dryness of the skin on your feet or anywhere on your body is referred to as xerosis. It’s more common in winter and leaves your feet flaky, itchy and irritated. In severe cases, your skin may also develop cracks or fissures, according to the Milton S. Hershey Medical Center College of Medicine. Cracks may eventually bleed and can lead to additional health complications. 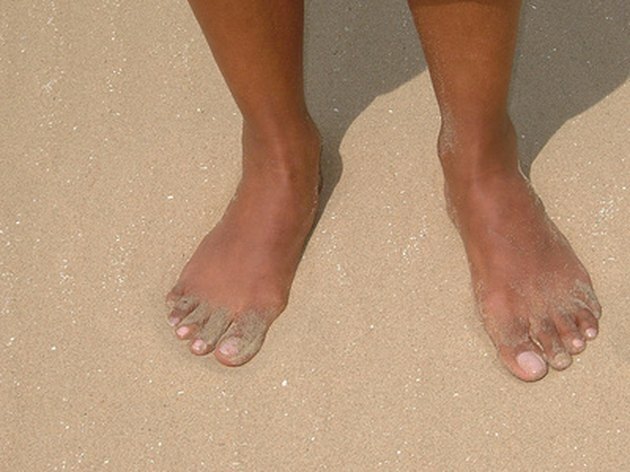 Your feet become very dry when you bathe in hot water, wear open shoes or spend too much time in the sun. Constantly wearing socks with or tights made with absorbent fabrics also robs your skin of its own moisture and oils. Infrequent moisturizing and medical problems such as diabetes are also factors. While cracks can develop all over your feet, especially on your heels, in most cases it’s the heels that are likely to bleed. When xerosis becomes so severe that your skin cracks, you should see your family doctor or a dermatologist, advises MayoClinic.com. Cracks on the feet prevent your skin from acting as a protective barrier, which can lead to infections, sores or ulcers. A doctor can properly assess your condition and determine the causes to recommend the best possible treatment. It’s best to treat dryness on your feet before it progresses to cracking and bleeding. However, if your feet are already at this stage, your doctor may recommend using wet dressings with mild astringents to close the crack, reduce oozing and prevent infection, according to the Mayo Clinic. A hydrocortisone cream or an over-the-counter cream containing lactic acid alone, or in combination with urea, can also help skin heal. Do not spend too much time in the shower or bath; exposure to too much water dries out skin and makes xerosis worse. Use cool or lukewarm water when bathing or showering. Add a few drops baby oil to your bath water, but be careful not to slip getting in and out of the bath. Pat your feet dry—do not rub. Apply a medicated or thick moisturizer to your feet while your skin is still slightly damp. Seal in the moisture with baby oil or a natural oil such as jojoba. After applying a medicated cream or lotion, wear silky socks, heel protectors or heel socks to trap moisture. Wash or change them frequently to protect your feet from an infection. Avoid wearing open shoes or wear sunscreen when going outside. The Hershey Medical Center School of Medicine also recommends eating a balanced diet and drinking lots of water to keep your skin supple. Avoid foot baths when you have xerosis, or any open wound or sore on your feet. Do not scratch your skin if it’s itchy. Apply cold compresses. Use a pumice stone to gently smooth out rough, cracked skin rather than using a sharp implement such as a scissors to remove the skin. What Are the Causes of Sudden Dry Feet?